The beach will most likely be your favorite spot to lounge and relax. 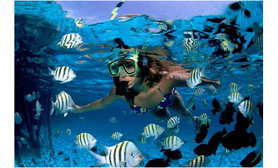 But if you’re ocean-bound in search of tropical underwater wonder, but would rather avoid battling the incoming waves, pay a visit to Xel-Ha on the Riviera Maya a natural aquarium located near Tulum, south of Cancun. This lagoon attraction is home to hundreds of species of tropical fish and natural fauna, making it an ideal spot for snorkeling and diving; the underwater limestone caves are a big draw. The ecological park is also home to exotic birds, lizards, a turtle park, a shark zone and dolphins. Adults get the run of Xel-Ha for $79, and kids for $40, although tickets pre-bought through our official website come at a discount.